A voucher for 15 Submissions ($300 value) - We recommend that you submit all 15 cards at one time. Valid for both trading card and card and autograph dual service submission types (must use appropriate submission forms and separate shipping/handling fees apply). Turnaround time is approximately 25 business days (for trading card service) and 40 business days (for card and autograph dual service). Maximum value per card allowed is $499. T3s, tickets and packs are not allowed on this voucher. Call for details. 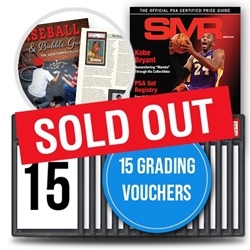 These offerings alone are a $451 value, but the PSA Platinum Membership is $202 discount.